Comments: Burning Bridget Cleary joined the world of Celtic music on St. Patty's Day in 2006 when, by what I would like to think was divine intervention, a group scheduled to play at a house party was unable to make the gig and father/daughter duo Lou and Rose Baldino stepped up to the plate. The duo was joined by Genevieve (Genna) Gillespie, Rose's childhood friend. Funny enough, it was Genna's family's group, Gilly's Hedge, who couldn't make it to the gig that fateful night. Write about Totes For Goats! 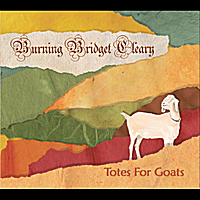 Want to write a review about Burning Bridget Cleary's Totes For Goats album? Post your comments in this box to be displayed in our community forums and in our album database! Please make sure you are logged in before proceeding. Please login to write your comments about Totes For Goats.